The Devil’s Saddle promontory is one of the most beautiful and symbolic places of Cagliari, both for its environmental features, which make it a real natural jewel within walking distance from the city centre, and for the number of archaeological evidences present on site, thanks to which you can discover the city's history, from the Neolithic to modern times. The first archaeological evidences such as “Grotta di Sant’Elia”, “Stazione all’aperto della Sella del Diavolo”, “Grotta dei Colombi” date back to the Neolithic. There are also evidences of the Punic and Roman times, such as the temple of Ashtart, better known as “Venere Ericina”, where it was practised the"sacred prostitution", Punic and Roman cisterns, works of water collection, quarries and a road. Also the Middle Ages left the sign of his presence in the Devil’s Saddle, which are still visible in the remainings of the Church and the Benedictine of St. Elia and in a tower. Still stand out, even though damaged by time and war events, the towers of St. Elias, built by the Pisans in 1282, and that of “Pohet”, in conjunction with the nearby towers of “Segnali”, also known as “Torre della Lanterna”, the tower of “Prezzemolo” and the eighteenth-century “Fortino di Sant’Ignazio”, a bulwark against the French invasion of 1793. Even during the Second World War the Devil’s Saddle hosted the anti-aircraft positions in defence of Cagliari. The Devil’s Saddle is also a wonderful natural paradise, protected by a specific legislation. 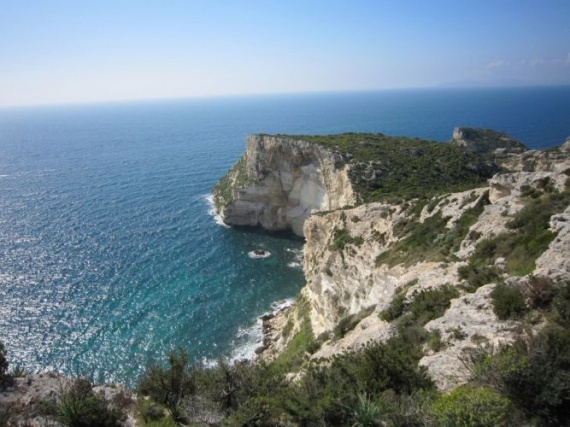 The promontory is made of Miocene limestone of the Quaternary with a biogenic origin, high and rocky coasts with some coves and several caves, characterized by a climate with strong temperature and remarkable excursion and saltiness. There are also many fossils evidences and a very interesting vegetation, such as (oleaster, carob, juniper, St. Peter's palm trees, mastic trees, Aleppo pines, holm oaks, euphorbia dendroides, thyme, esparto, etc), with peculiar endemism (canalicolato narcissus, scrophularia trifoliata, bellium crassifolium, iris planifolia). Also the fauna is particularly interesting. In the Devil’s Saddle abode and nest the peregrine falcon and the kestrel, the swallow, the shelduck, the Sardinian partridge, several species of corvids, sea birds, foxes, wild rabbits, wood pigeons, turtle doves, the starling and various passerines. The area is currently accessible through the path marked by green dots that guide hikers, traced in the early two thousands by the environmental associations “Gruppo di intervento Giuridico Onlus” and “Amici della Terra”, with the help both of the Autonomous-Military and Maritime Command of Sardinia, holders of the military state property of the Devil's Saddle.